I haven’t posted any of my on going projects in a while so thought it was about time I did. It’s not that I haven’t been working on anything, I just haven’t thought about posting my progress. I was a crocheting maniac throughout the holidays. I was lucky to remember to take pictures of my finished projects. 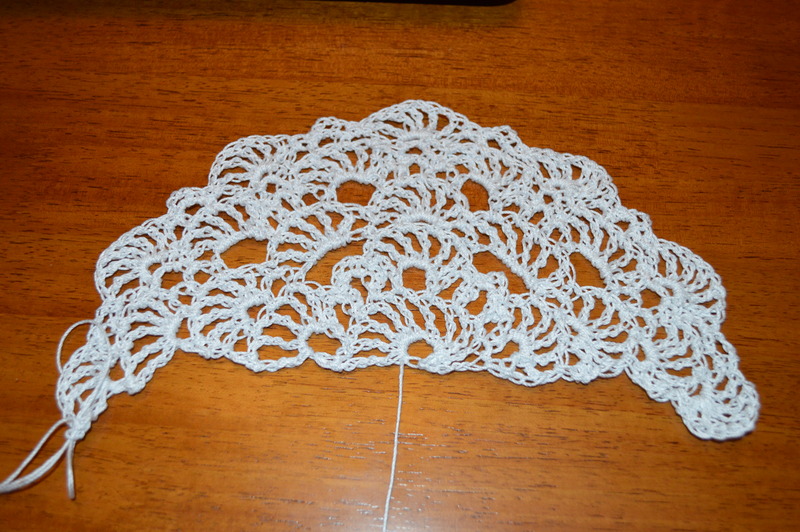 This little bit of lace is the beginnings of a scarf I’m testing for Shyama Nivas on Ravelry. It’s probably the fourth or fifth test I’ve done for her so far. I’m using Aunt Lydia’s Size 3 Cotton and I’m not sure I’m really liking it. It’s too stiff and not as soft as I would like. I wanted something light and airy for spring and summer but not sure this is going to be it. I may end up changing yarns before I get too much further with this. I have a nice soft silk bamboo from Paton’s I may end up using. It’ll be heavier than I originally wanted but it will be soft and drape beautifully. Now this afghan has been in the works since September 2012 when I joined a mystery CAL on Ravelry. It was designed by Julie Yeager and is called September Morning. I’m using Red Heart Soft in teals and browns. Technically we only had to do two squares of each motif but I wanted a larger afghan so I’m doubling it and making four of each. I’m not sure of those light brown background motifs though. I may rip it out and just make them all off white. The light brown is kind of annoying and I’m not liking it the more I look at this picture. 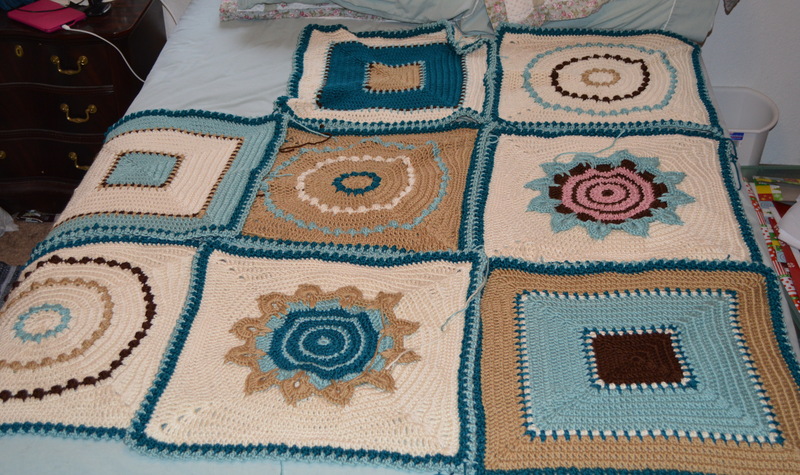 Thank goodness I haven’t weaved in ends yet, but I really do hate the idea of ripping those squares apart. I just finished a sun/flower motif with the brown background as well. What do you think? Keep it? Maybe once I get the others done and play with the layout a bit?